As the world mourns the death of the great statesman, RIR looks at his long-established relations with Russia and the Soviet Union, which played a major role in fighting the apartheid regime in South Africa. When Nelson Mandela turned 95 in July, Vladimir Putin paid one of the most glowing tributes to the great leader. “Your name is inseparably linked with an entire epoch of Africa's modern history that heralded the building of the new and democratic Republic of South Africa,” the Russian president said, while also praising Mandela’s contribution to developing ties between the two countries. No discourse on South Africa’s struggle against the tyranny of apartheid can be complete without a mention of the role of the Soviet Union, a country that that the great South African leader held in the highest esteem. On April 30, 1999, when Mandela on a state visit to Moscow was awarded two honorary doctorates from the Russian Academy of Sciences, it was a celebration of a good relationship that lasted the greater part of three decades. “I would interpret your action also as a tribute to the intellectuals of our country, of all colours and backgrounds, who have followed their calling to fashion the complex experience and aspirations of our diverse society into a single, realisable vision of a society at peace with itself,” Mandela said, accepting the honour on behalf of his country. During the state visit, Mandela expressed gratitude for the “solidarity of the Russian people in the South African fight against apartheid and for freedom.” The Soviet Union was at the forefront of the anti-colonial and anti-apartheid movements. At a time when segregation was a norm in many parts of the United States, Moscow strongly promoted the concept of equality of races and nations. It’s no secret that the Soviet Union was the biggest benefactor of the African National Congress (ANC), which was put in America’s list of terrorist groups in the 1980s by the Ronald Reagan administration. 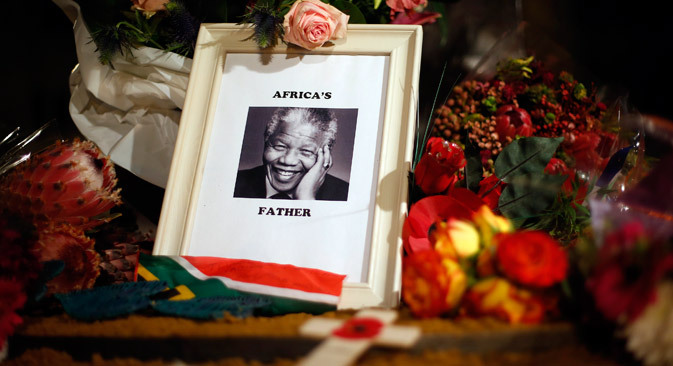 Given the huge role that the Soviet Union played in freeing South Africa from the racist regime, it was no surprise that Mandela maintained a soft corner for Russia, long after the collapse of the Eastern bloc. In 1990, the same year that he was released from prison (after 27 long years), the Soviet Union awarded Mandela the Lenin International Peace Prize. The great South African leader was the last person to be awarded the prize by a country that vanished soon after, but he valued the award enough to follow up on it. After his first and only state visit to Russia, Mandela asked his aides to find about what happened to the medallion. In 2002, Russia’s ambassador to South Africa, Andrei Kushakov handed over the gold medal to the statesman. “No one is born hating another person because of the colour of his skin, or his background, or his religion. People must learn to hate, and if they can learn to hate, they can be taught to love, for love comes more naturally to the human heart than its opposite.” Nelson Mandela in The Long Walk to Freedom. “Much has changed in the world since the award was given to us, but the world's need for the human solidarity which that generous gesture demonstrated remains as much as ever,” he said on receiving the prize. Mandela’s state visit in 1999 set the tone for greater cooperation between Russia and South Africa. During that visit, Mandela and Boris Yeltsin signed a declaration pledging to boost political ties and economic relations in areas such as gold and diamond production. Since that time, the countries have stepped up bilateral and multilateral cooperation with Moscow being the strongest backer for South Africa to join the grouping of Brazil, Russia, India and China, which went from BRIC to BRICS. The development of ties and growing solidarity between the members of this grouping is something that would have made Nelson Mandela, one of the greatest statesmen to walk this earth, a very happy man.